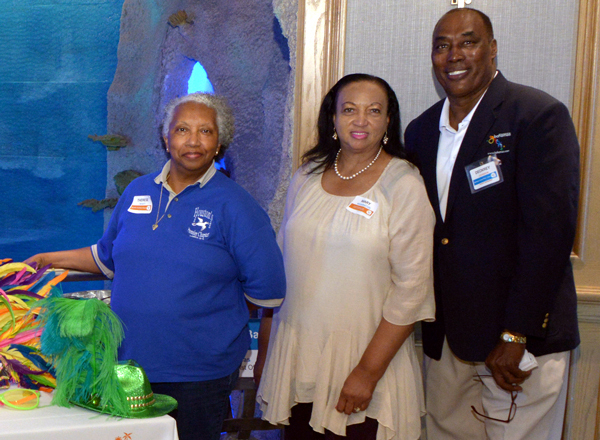 Bahamas team hosting travel agents at Houston Downtown Aquarium: L-R - District Manager, Dupree Smith; Anishka Dean and Margo Rose, Houston inside support team; PJ Douglas Sands, Sr. Manager, Houston; Sanique Culmer, Senior Manager, Events, Grand Bahama; Deckery Johnson, Manager, Houston; Valery Brown, Sr. Director, Sales and Jeannie Gibson, Manager, Communications. FORT LAUDERDALE, FL - May 19, 2017 – Aquariums in both Dallas and Houston proved to be winning venues that served as the perfect backdrop, and helped to deliver a Texas size success for the recent Bahamas Travel Agent events. 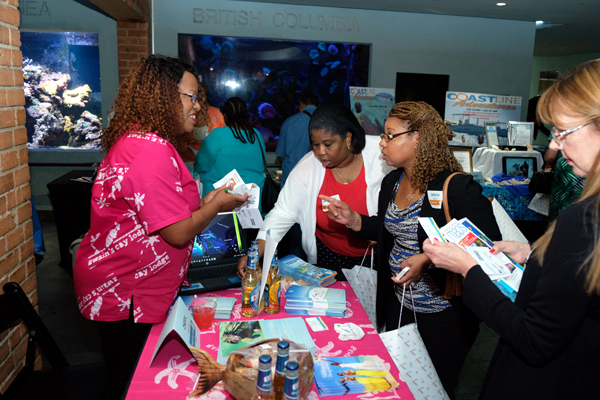 In both Dallas and Houston, the energy, excitement and enthusiasm of the Travel Agents at the Bahamas events was palpable, however, the enthusiasm crescendoed at the event in Houston with scores of agents jamming the third floor of the Houston Downtown Aquarium. Agents getting passports stamped by Sheryl Bastian of Swains Cay Lodge, South Andros. The agents excitedly conversed with the suppliers at the events as they got their passports stamped - a document proving that they had visited all of the suppliers in attendance. Throughout the night, phones were out and there were lots of picture taking as agents did not have to be reminded or encouraged to take selfies for posting to twitter with the hastag #travel Bahamas. The event in Dallas set the pace for the Texas shows, with excited "whoas” throughout the night, until one speaker said, for a minute he thought he was at the Jerry Springer Show. The fun and excitement did not take away from the information that was shared and well accepted. Agents in Dallas said that the flow of the show was perfect; they lauded the "passport" concept and said that the talk show format with the vendors was much better than just a presentation. Excited agents entering the room for the evening's event Houston. In Houston one of the fish tanks in the Aquarium served as the main backdrop and a Bahamas Junkanoo Carnival headpiece as the costume for social media photos. Next it was the Congo line with a lively Bahamas beat and shouts of "BAHAMAS" taking agents into a three-course dinner and Presentation. The night was then topped off with a show-stopping performance by Bahamian International recording music star, Dyson Knight, of the famed group, Bahamen. The Texas events held in Dallas and Houston were a part of the Bahamas Ministry of Tourism's efforts across the U.S. to engage travel agents and update them on new and recent developments in The Islands of The Bahamas, including new hotel resorts, exciting sporting and cultural events and current airlift. 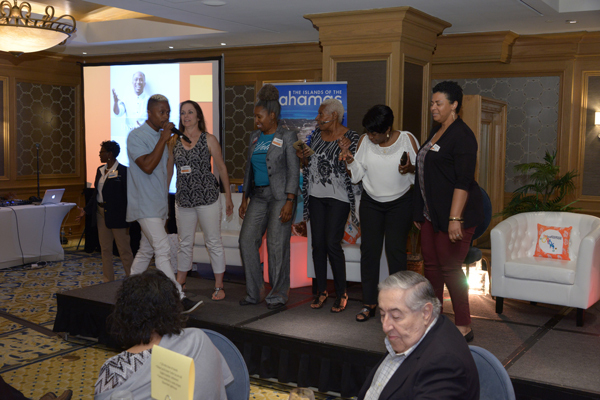 Dyson Knight, Bahamas International recording artist, entertaining the crowd while teaching travel agents, Bahamian dance moves. 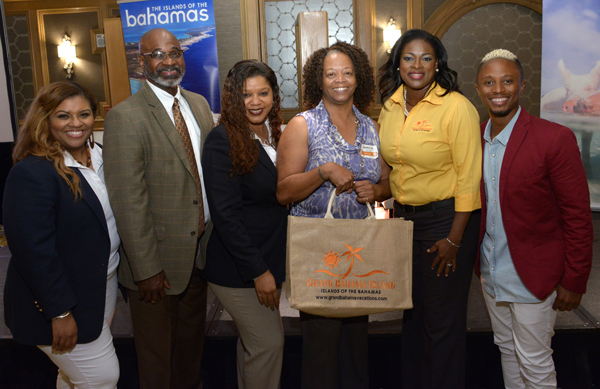 Prizes from suppliers were presented throughout each of the events, with the Grand Prize provided courtesy of Grand Bahama Tourism Board and its members along with Bahamasair who provided two round trip tickets to Grand Bahama from Miami Florida. The prize featured hotel transfers in a limousine provided by Forbes Charter Service, a Dolphin Experience for two, courtesy of Unexso and a three-day/two night stay at the all-inclusive Viva Wyndham Resorts. As travel agents left the event in Houston, Ron Davis of Action Travel shared that the event was such a grand success that he did not know how they were going to be able to ever top it. 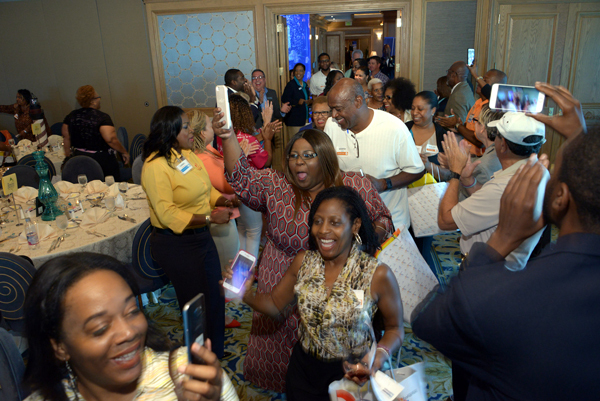 Renee Murff Martin, said that, "the presentation was great, the music was great, and Dyson was just awesome," she said that the event had given her everything she needed to go out there and continue to, "sell, sell, The Bahamas." Talk show with Grand Bahama representatives being hosted by Dupree Smith at Dallas TA Event. 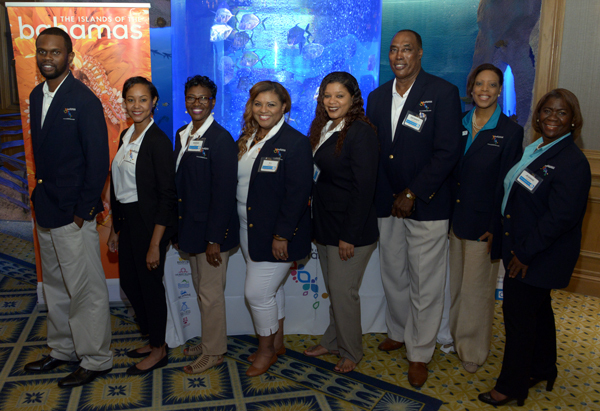 The overall Bahamas team also included representatives from Bahamasair, the country's national flag carrier. 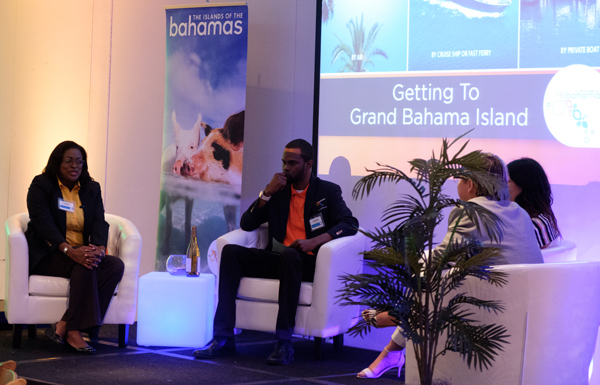 Woodrow Wilson and Rachelle Mortimer shared with the travel agents on the airline's upcoming direct non-stop flights between Houston's George Bush and Nassau, Bahamas, scheduled to start in November of this year. Agents getting passports stamped by Sheryl Bastian of Swains Cay Lodge, South Andros, at Dallas event. 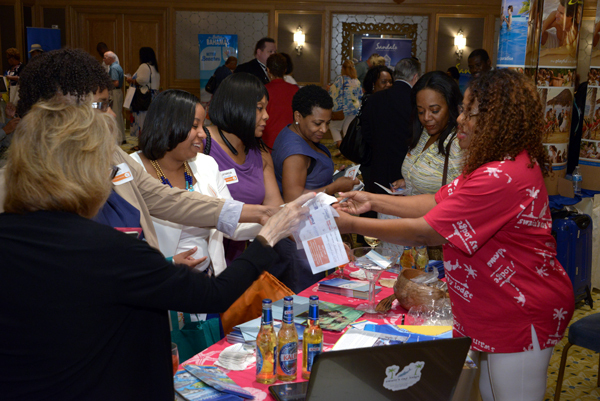 Suppliers at the event included representatives from The Bahamas Ministry of Tourism partner boards, The Out Island Promotion Board, The Nassau/Paradise Island Promotion Board and the Grand Bahama Island Tourism Board. Participating hotels included - the Atlantis Paradise Island and Sandals and Breezes Bahamas, Nassau; The Grand Lucayan, Grand Bahama; Valentine's Resort, Eleuthera, Clubmed, San Salvador and Swain's Cay Lodge, Andros Island. Also representing the Out Island was Coastline Adventures, Exuma, an adventure tour company. Wholesaler partners included Vacation Express and Pleasant Holidays. Although not in attendance, Embrace Resorts, Exuma and the all-inclusive Warwick Paradise Island, provided prizes of hotel night stays. Deckery Johnson, Manager, Bahamas Tourist Office Houston, with Travel Agents. The Grand Prize Winner at Bahamas Tourist Office Houston Bahamas Night won two round trip tickets between Florida and Grand Bahama; ground transfers compliments of Forbes Charter Service; Dolphin Experience for two compliments of Unexso and three day/two nights accomodation at the all inclusive Viva Wyndham. At presentation L-R PJ Douglas Sands, Sr. Manager, Houston; Woodrow Wilson, Bahamasair; Sanique Culmer, Grand Bahama Ministry of Tourism; Prize winner, Marilyn Milton of M and M Travel; Carmel Churchhill, Grand Bahama Island Tourism Board and Bahamian International Recording Artist, Dyson Knight. Group Photo at Bahamas Houston Travel Agent event.